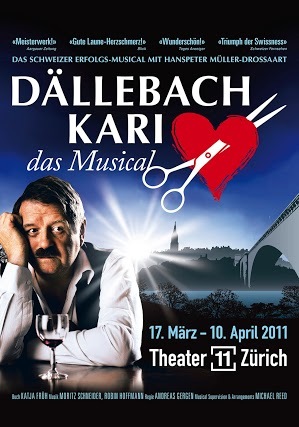 The tragic and yet comical figure of Dällebach Kari is a legend in Switzerland. This inwardly torn hero and his tragic love story are enough subject matter to create the perfect template for an emotional musical. That is why the Heimatland Verlag has worked in collaboration with the Thunerseespielen to create a different version of the story of the most famous hairdresser in Switzerland. 76,000 spectators were carried away by the emotional story at the World Premiere at the Thunerseespielen. The Schweizer Fernsehen SFR and the magazine “imSchweinwerfer” celebrated the global appeal of the “DaCosta Kari – the musical”, and nominated it for several awards, including “Best Swiss Musical”. And this is what the press thinks: “Masterpiece” (Aargauer Zeitung), “Beautiful!” (Tages-Anzeiger), “Excellent humor despite the heartache” (Blick). The musical was awarded the “Prix Walo” for best musical.